Albums might be a dying breed in their traditional sense, but that doesn’t mean that one comes along from nowhere every now and again to knock your cotton socks off – and Pageant Material is one of them. I know what you’re thinking: a country album, really? Darn tootin’ it’s a country album. 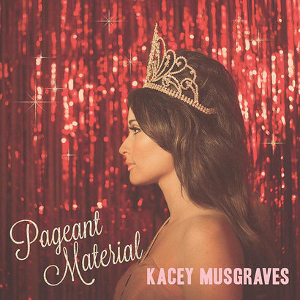 This is Kacey Musgraves’ second studio album, after becoming a major star in the Nashville scene with her last one. This one is where she’ll break through into the modern consciousness though it seems, but it’s more than clear from her down-to-earth tone that she’ll not be following the trail that fellow country starlet Taylor Swift has blazed before her. This album could not be more steeped in Southern style if it tried, and there’s no doubt that they did. In every song and every tune you are instantly taken to the dustbowls and the lazy hollows and the swamps and the bayous of the South with the guitars and the fiddles and Musgraves’ refined voice. And in that sense of place it makes the album shine in a way that a collection of hits couldn’t. If you sit and listen to the whole thing you are in for a real experience and there’s precious few albums that do that in the age of Spotify and iTunes. The song-writing in Pageant Material is so good at toeing the line between conversational jokes and making real and poignant observations about life there in the South but everywhere in general too. The title track features the fantastic lines: “And it ain’t that I don’t care about world peace / But I don’t see how I can fix it in a swimsuit on a stage” for goodness sake. You can laugh out loud at the likes of “family is family in church or in prison” but when you stop and think it really does mean something. This gives it a lasting appeal that does better than the bluegrass melodies or the wise-cracking jibes could ever do on their own. Musgraves really is the star of the show though, with a voice that’s sweet and soft for all of the slower stuff but has that real country edge to it to kick the more upbeat songs into gear. She doesn’t quite have the power of the country gals of old, but the songs she’s written never really need it – and that’s why song after song on this albums sees her play to her strengths. The songs flow brilliantly and when they purposefully don’t Musgraves is more than a match. Pop stars nowadays often try to show that their voice can hit the highest of highs and be as loud as you’ve ever heard, but to me this controlled and composed performance is infinitely more impressive. And an album full of strengths it is. The songs are laid back and relaxing with the odd one giving you a bit more in the way of toe-tapping Dixie delight but it’s hard to pick only a few to deserve special mention. “High Time” kicks off the record with a more poppy ode to enjoying life as it is, while the album’s first single “Biscuits” covers the country sing-along brilliantly – especially when the chorus’ focal point is as good a line as “mind your own biscuits and life will be gravy”. Packed further down the record though are some tunes that are more sombre but just as impressive. “Somebody to Love” strikes at the heartstrings with a slow and targeted look at everybody’s vulnerabilities and hypocrisies but rounds it off with the simple, soft but jaw-dropping realisation that it’s ‘cause we’re all looking for somebody to love. “Cup of Tea” is also one of my favourites, with a guitar that plucks along nicely and Musgraves nailing the stuttery delivery to go along with it with a voice of velvet that softens to the point of breaking so many times in a way that’s incredibly cute. While it may come from left-field, this is so far my favourite album of the year – packing some relaxing and genuinely entertaining songs with a whole lotta heart and a sweet voice you’d never tire of hearing. Even though country’s far from my go to when it comes to music, albums like this full of fantastic songs really make a refreshing break from the usual. No matter if country’s not normally your “cup of tea”, there’s something to love about this album.